SimpliQ Bootstrap 4 Admin Template is constantly developed and maintained by our team. The proof of this is fact that we release minimum 2 updates per month. SimpliQ helps you maximize your productivity. Our Bootstrap 4 Admin Template allows you to accelerate you development process and save hundreds of dollars. We're UX & UI Experts and we know everything about bootstrap! Over 100.000 people and companies use our Bootstrap Templates. Among our customers you can find big guys from Silicon Valley, members of the Fortune 500 and Startups. Save thousands of dollars for UI and UX designing. Well documented and great support. 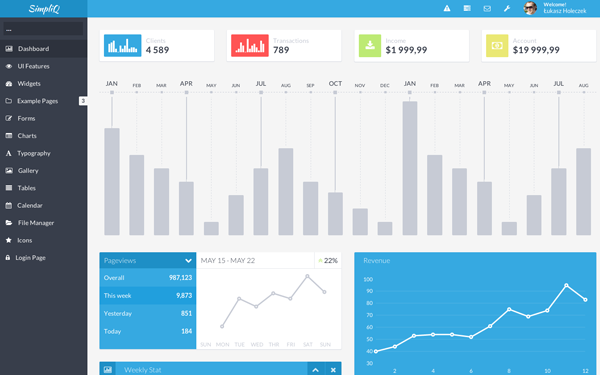 SimpliQ Admin is a responsive and multipurpose admin powered with Bootstrap 3.3.7 & Bootstrap 4.0.0. SimpliQ Admin supports AngularJS, Angular 5, React.js and Vue.js frameworks. SimpliQ Admin can be used for any type of web applications: admin panels, admin dashboards, eCommerce backends, CMS, CRM or SaaS. SimpliQ offers bunch of plugins and UI components and works seamlessly on all major web browsers, tablets and phones.